Black bear Dakota has a new home at the Milwaukee County Zoo, now located in the former Asiatic Bear Exhibit, behind the Camel Yard. At 28-years-old, Dakota has slowed down due to age and joint stiffness, and has become difficult to shift on and off exhibit at times with black bear Cinnamon. With the black bears starting to slow down for hibernation in the winter, getting them to cooperate with the shifting routine can be especially difficult. The combination of Cinnamon and Dakota having occasional minor squabbles and Boris the brown bear taking turns shifting with the black bears aided in the decision to move Dakota. Shifting had become difficult, especially if one bear would not cooperate, all three were stuck in a holding pattern until the holdout shifted as needed. With the black bears’ reduced mobility, and the addition of Boris in the area, the decision was made that Dakota’s move would benefit all three bears. Dakota’s new home provides a more comfortable environment for Dakota, who had been taking more time navigating some of the taller steps in the Black Bear Exhibit. 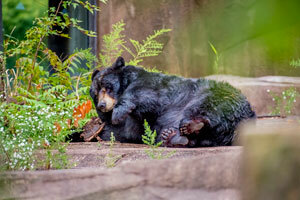 The former Asiatic Bear Exhibit provides a more fitting home for Dakota. The exhibit is smaller and has shorter steps, making moving around the exhibit easier for her. Additionally, if Dakota decides not to move when asked, there are no longer other animals who have to wait for her to move before they can go outside. Dakota has been adjusting well to her new home. Having the exhibit to herself makes for a more flexible routine for Dakota and her zookeepers, especially if Dakota does not feel like moving around a lot in a given day. Dakota is still on exhibit daily for the public to visit. She will be able to hibernate as usual at her new exhibit. Give her a warm welcome in her new location.